After all the commotion over one of the most exciting finishes in NFL history, it makes sense that the moment be honored with a bobblehead. We’re about 10-15 years removed from the peak of the intense bobblehead craze during which fans would line up outside stadiums for hours (or days) to get their hands on the must-have items. But that’s not to say the dolls are no longer popular or relevant. If they weren’t popular, would there be a National Bobblehead Hall of Fame and Museum, founded a couple years ago and headquartered in Milwaukee? 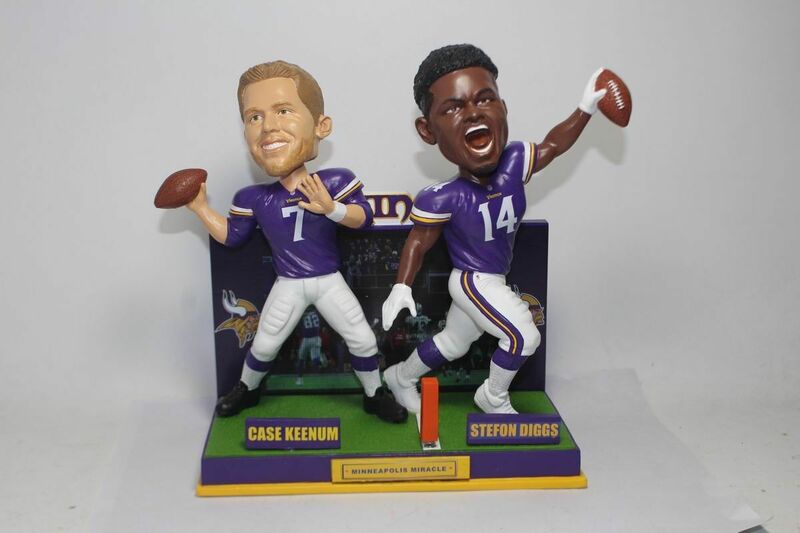 And if they weren’t relevant, would that very same Hall of Fame have released a bobblehead of January’s Minneapolis Miracle hookup between Case Keenum and Stefon Diggs? The initial production batch of 180 bobbleheads sold out, but orders are being taken for the remaining 820 with delivery by December. As for the artwork, I’d say they captured Keenum’s appearance pretty well and definitely put Diggs in the right pose, though I’m not sure they quite captured the spirit of Diggs’ face.